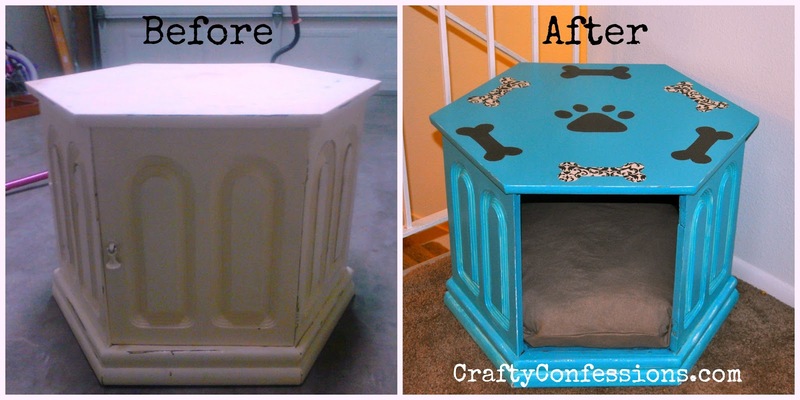 A while back I found this adorable little gem from Lucy Designs on Pinterest and knew I had to make one for Lucy, my spoiled little mini dachshund. After a few weeks of searching the classifieds I found the perfect side table at the perfect price. First, I removed the door and set it aside for when inspiration strikes. Next, I sanded the table with an electric sander--holy cow were my fingers tingling! 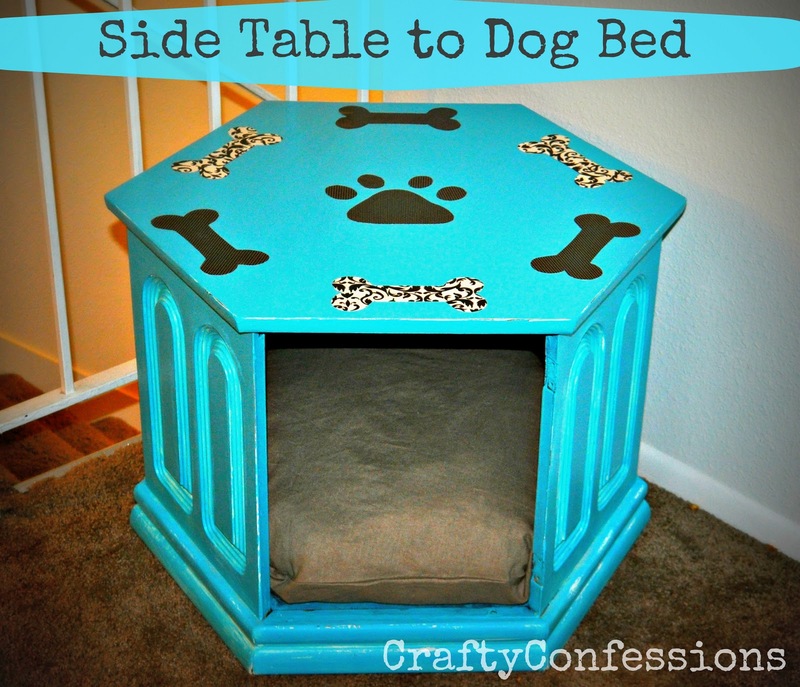 I painted the entire table with turquoise paint. I used a Valspar sample size from Lowes and I still have some left over! Next came my favorite part: Mod Podge. I LOVE Mod Podge! 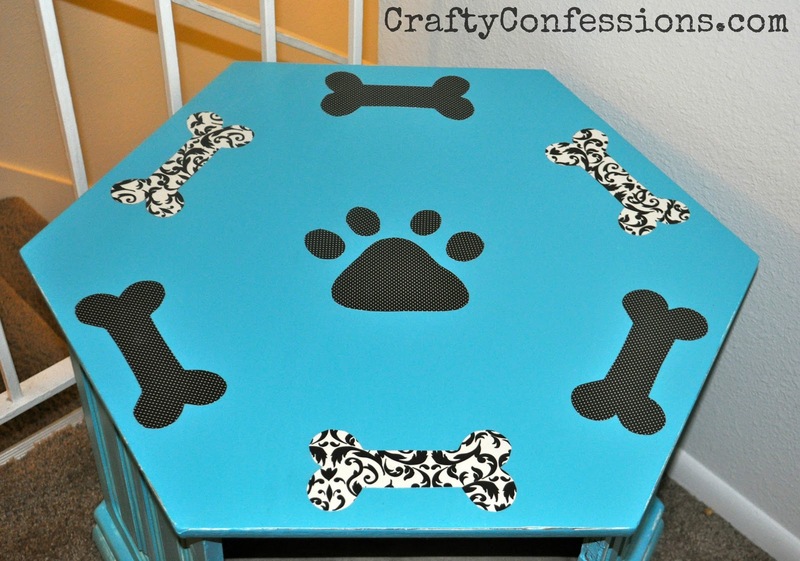 I dug into my paper stash and cut out some "fancy" dog bones and a paw print. I adhered the designs to the top of the table and gave the whole thing 3 coats. I used my brand new, fancy-shmancy Mod Podge tools, so I was feeling pretty cool. Finally, I sewed a pillow to fit inside by tracing the top of the table. I filled the pillow with a mix of stuffing and old family blankets so she would have our smell. The table cost me $10 and the paint was around $3. I had the rest of the supplies on hand. In the end, this project cost me less than $13. I couldn't have bought a cheap little dog bed for that amount! That is too freakin cute! LOL! I have a little Bichon Frise and there is not way he'd go in there. But that is so cute! I'm waiting for your linky party to open and stopped by early. I'll be back! This is adorable. 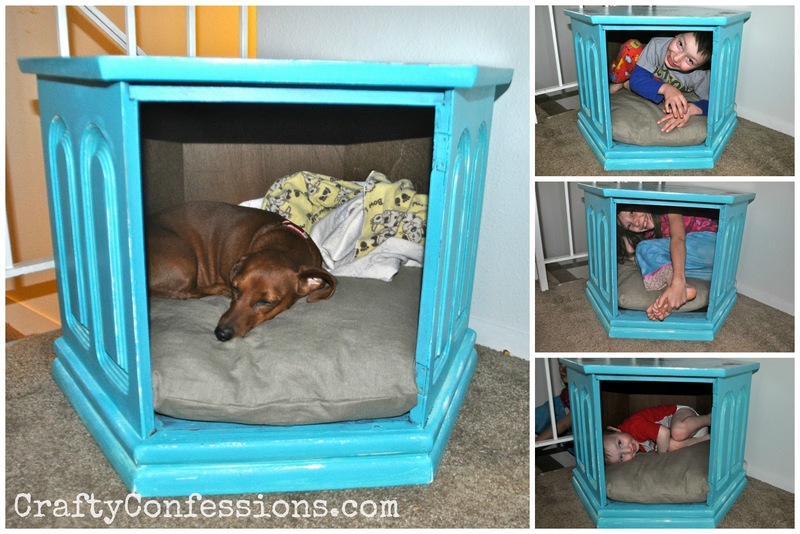 Our puppy would love this kind of bed, particularly if he could use it to hide from the kiddos! so cute! what a great idea. all the dog stuff takes up so much space (and we have 2 big ones). this serves 2 purposes and is super cute!